This is no chain letter, hoax or prank. It is a sincere warning about your home and the entity which dwells within. Your home has been haunted for quite some time. I am sorry that I could not personally deliver this document. I did not even post it myself. The postmark on the envelope will not help you, should you ever attempt to locate me. When this letter is complete, I shall entrust a friend in another country with repackaging and sending it on my behalf. This letter also may or may not have been translated from its original language. You do not know me. You must never know me. Neither do I know you, beyond your name, address and appearance. I have seen you in person but you have not seen me. Think back to the day that you moved into your home. I contrived to pass by as you stood outside. I saw your face, but you did not so much as glance my way. I did not stop moving: I simply committed your face to memory and departed before you became aware of my presence. Why did I want to see you? I suppose my conscience drove me to it. Just as it compels me to finally write this letter. I wanted to see exactly who I was passing the entity on to. Chances are, you already know this thing only too well. I may be preaching to the converted, in which case I hope you will at least draw comfort from the fact that my partner (who I shall refer to as Tom, although he may or may not be male) and I once knew your misery. The entity exists within your home. You may not be aware of this yet and I suppose you may not thank me for informing you. But please trust me: it is present. You see, Tom and I lived at your address in the years prior to your arrival. I feel for you, my friend, because I am partly responsible for your situation. You are stuck with this apparition. I am afraid I cannot tell you how to free yourself. I can only pass on certain warnings and ideas for coping with it and keeping matters somewhat under control. Tom and I were happy enough when we moved in. The location was fine for our purposes. I will not disclose our professions, but we worked in very different sectors. Everything seemed to be going our way. We had been together for seven years. We had each other. We had our health. You only tend to appreciate such things when they are gone. I was pleased with most aspects of our new home. The kitchen sink could be difficult at times, as you may also have discovered, but what really bothered me was sleep. I had always been a sound sleeper: I never even had cause to think about it. So after a year of residence there, I was surprised when my nocturnal patterns took a turn for the worse. I would wake in fits and starts throughout the night. I was no longer getting the deep sleep, the ‘REM sleep’. In the dead of night I would stir, blink and wonder why I was suddenly conscious. Sometimes Tom would already be awake and we’d peer at each other, bleary and confused. Often as I was drifting off to sleep, I would snap awake, my whole body jolting. Other times I would feel paralysed while asleep and had to struggle to wake myself back up. It felt like I was drowning, breathless, lost in the pitch-black fathoms of the night. Since Tom shared my symptoms, I was reassured. Selfish I know, but truthful. We tried turning the mattress over. We tried new pillows. A new duvet. Nothing changed the apparent fact that we had lost the ability to sleep well. I am sure much of this will sound familiar to you. If not, then believe me it will. Two years after moving in, Tom and I were far more fatigued than we should have been, even given how hard we worked. Some mornings we would feel as though we had not slept at all, suffering from headaches and barely able to peel open our eyes. Tom would always call it “the unfair hangover”, since we drank moderately. Or at least, we did when this all began. Later on, I would often drink heavily just to help myself through the night. I am already surprising myself by giving you more detailed information than I had intended. When I began this letter, I wanted to briefly and bluntly outline your situation, offer you some useful advice and get out of here. Yet writing this document is a potent source of catharsis for me. Maybe I will give you a full account of our experience. I have time on my hands and here, in my part of the world, the day is young. So. Those unfair hangovers became a daily occurrence. We learned to keep Ibuprofen on bedside tables to deal with the morning headaches. When we awoke feeling like death, knowing we’d have to deal with the latest heavy schedules at work, strong coffee became our saviour. If I could, I would have eaten the raw coffee beans. My lack of sleep gave everything an unreal tinge and a sluggish inertia. I seized upon a diagnosis of carbon monoxide poisoning, but subsequent, hastily-arranged professional tests led to nothing. I installed a carbon monoxide detector by the fridge, which continued to produce negative results. Tom and I both made silly mistakes at work. Cracks were really beginning to show. In my line of work in particular, this was unacceptable. It would cause major problems and put other people’s lives at risk. One night before bed, I found myself staring into the bathroom mirror, surrounded by darkness. Virtually in a state of fugue, I barely realised what I was doing. I peered into my own reflected eyes, vaguely wondering when Tom and I might grab a decent night’s sleep like everyone else in the world. In a flash, those mirrored eyes transformed. They became blank with a grim-blue tinge, staring right back at me. I recoiled, afraid to meet that unearthly gaze again. Gripping the sink, I struggled to calm my breathing. When I finally dared to look back into the glass, my eyes had returned to normal. I blinked and the reflected eyes followed suit, making me sag with relief. It struck me just how dog-tired I was. I was seeing things which were not there. As I lay beside Tom, I silently debated telling him about the mirror. I chose not to. A few nights later, I heard him yell something in the bathroom. Dashing through, I found my partner with his hands over his face and his back to the mirror. He was actually crying, which disturbed me. I’d always thought of Tom as strong and reined-in. Exhaustion had rendered us overwrought, forcing our emotions to the surface. Coaxing his hands away from his face, I gently encouraged him to open his wet eyes, but he would not. Tom looked so astonished and shaken. We practically collapsed onto the mattress and drifted off into sweet, precious sleep. Sadly, Tom and I now did little else on that bed. The next thing I knew, maybe two hours later, there came a gurgling, choking sound. I jerked awake with a start. As usual, I didn’t know why I had woken up. Threads of moonlight illuminated great strips of the room. Everything was so very silent, as though we were in a vacuum. There was a strange, heavy feeling in the air. Wondering why I felt so apprehensive, I cautiously studied the room. It was little more than a silhouette. The silhouette of what resembled a small child, perched on the foot of the bed with its back to me. As if sensing my gaze upon it, the figure seemed to drop smoothly, soundlessly down towards the floor, out of sight. My whole body seized up, the bed sheets bunched tightly in my hands. I stared down the bed’s length at the spot where the figure had been. Had it really been there or was it a shadow, a trick of the light? Was I dreaming? I wondered what the hell to do. Mindful not to wake Tom, I gently shrugged the covers aside and grabbed a torch from under the bedside table. Being the careful type I always kept one there, wherever I was in the world. As my bare feet touched the floor (which was carpeted in those days – you or an agent may since have had this removed), I shivered, expecting something to grab me. When nothing did, I rose to my feet. I crept around to the foot of the bed and examined the area where I’d seen that figure. Even shone the torch on it. I surveyed the floor and everywhere else I could think of. I found nothing. I had no idea of what I was even looking for. But in the pit of my stomach, there was an unquestionable disturbance. Had I witnessed the supernatural? No. That ‘thing’ at the end of the bed had been an illusion, made all the more tangible by my feeble state of mind. No sense in adding to my problems. Over some much-needed coffee, a friend suggested that Tom or I might be snoring. We hadn’t considered this possibility as neither of us had ever experienced the issue. Like Tom, I kept myself trim enough and it seemed to me that excess body weight was a primary cause of snoring. Research, however, quickly brought me the facts: snoring could be borne of several factors, including smoking (which neither of us did), sleeping position and allergy. I decided to run a test. My God, how I wanted snoring to be the answer. This nightly problem threatened to wreck our livelihoods and relationship. Tom and I were become short-tempered. Our usual saintly patience for each other’s defects was running low. One evening, what would normally have been a good-natured debate over the washing-up became a screaming row. Tom even smashed a plate on the cooker. Devouring more research, I was concerned to read about Sleep Apnoea, a disorder involving abnormal pauses of breath. It could even prove fatal. I remembered that choking, gurgling sound, which had stopped abruptly as I awoke. It seemed to fit the bill, which made me wonder if I did have this illness. Perhaps I really was snoring all night, waking both myself and Tom up on a regular basis. I decided to record us both asleep, for the duration of the night. This would surely find us some answers. Excerpt ends. The full story is 10,000 words in length. Dare you go on? Order the Ebook Edition or the terrifyingly personalised Paper Edition now! 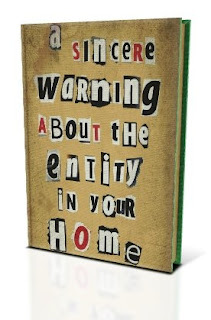 This excerpt from A Sincere Warning About The Entity In Your Home (c) Jason Arnopp 2012-2013. Please do not reproduce elsewhere without permission.